Today, my blog turns one year old! I have met great food bloggers and food aficionados in the past year. Each one of the bloggers are super nice human beings with so much limitless talent. They have taught me so much about food, running a business, promoting my product and above all, how to be a good person. As a result, I stand here before you, a better person today. I would like to thank everyone for making this a successful year for me and this blog. To thank all of you, I present a colorful tomato dish that you will love to make and enjoy eating. This dish is one of my all time favorite dishes to make. I took all the best tomatoes I could find and added them to this recipe. This includes Yellow tomatoes, plum tomatoes and beefsteak tomatoes. The yellow tomato provides a wonderful layer of taste and color. 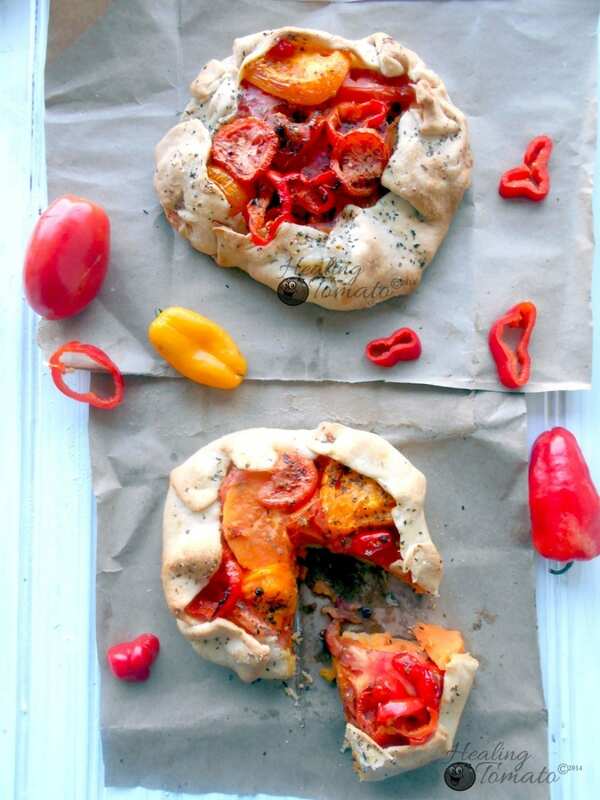 On many movie nights, this tomato galette is the dinner meal to enjoy. It is so much better than ordering pizza, plus you don’t have to tip the delivery person. Sometimes, the tomato galette is referred to as a tomato tart. The difference is delicious sweet potatoes. They make the base of the galette, along with the tomatoes. To keep it vegan friendly, I decided not to use any cheese in the galette. However, if you want to try cheese, the best type would be goat cheese. For vegans, try this spabettie’s recipe for making vegan goat cheese. It is very easy to make and offsets the sweet potatoes perfectly. Instead of going for a store bought version, I decided to make my own pie crust recipe. My recipe doesn’t use shortening, but, you can substitute it for the whipping cream. What has been your favorite recipe so far? If you can find get fresh basil leaves for the recipe, use them. Otherwise dried basil will work just as well. Add a layer of the sweet potatoes and brush with the butter combination again. 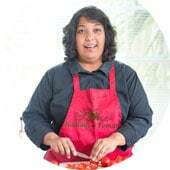 One more think I am following you now because I do not like tomatoes and I know they are so good for you so I am hoping you can help me find a ways to start eating and liking them besides in tomato sauce and ketchup. I can be healthier if I start to eat them so many good things about them I like them in sauce even in chunks but they must be hot because cold tomatoes is something I just really do not like. I however will try your recipes my husband loves them …ugh help! Thank you, Hollywood K. I always suggest to people that they start out with eating cherry tomatoes. There is nothing quite like getting the taste of it directly. Eventually, move over to plum tomatoes. However, if you have a hard time with tomatoes, start with munching on Sun-dried tomatoes. Once you have developed a palette for it, you will be able to get used to cherry tomatoes slowly. Let me know how it works out for you. I would love to see you eating cherry tomatoes by the end of the year. Looks awesome and such lovely colours. Congratulations on one year, from looking at your blog Id have said you had been blogging a lot longer. Thank you, Rebecca. I appreciate the wonderful compliment. Love this! Happy Belated Bloggerversary! My youngest daughter is a tomato lover and she wants me to make this for her. Will give this a try. Thank you, Erlene. I hope your daughter likes. These look sooooooooooo beautiful and delicious! Thank you so much, Winnie. I appreciate the comments. Looks amazing and delicious. Great job and Happy Blog-aversary. Love tomatoes any way….any how and these look perfect. What a wonderful recipe. I can’t wait to give this a try. Now that is a work of art. Thank you for the recipe Healing Tomato! This is a beautiful galette Rini. I love the colors and how the flavors bake together. I love the rustic allure of a galette. This looks really delicious. Happy Bloggaversary! 🙂 Looking forward to many more years of delicious Healing Tomato dishes to come! Oh, and I love the idea of cream in a crust! Can’t wait to try this one! Thank you, Ellen. Your words made my day. Happy Blog-a-versary! I can’t think of a better way to celebrate than with this gorgeous and tasty looking galette! You’re an inspiration to us all with all that you’ve accomplished in just one year! Thank you, Kelly! You are very sweet and I appreciate your support. Rini…first congrats on your 1 year Bloggiversary! I am shocked you have only been blogging for a year! Your posts are so well written, informative and entertaining…I thought you have been blogging for much longer! 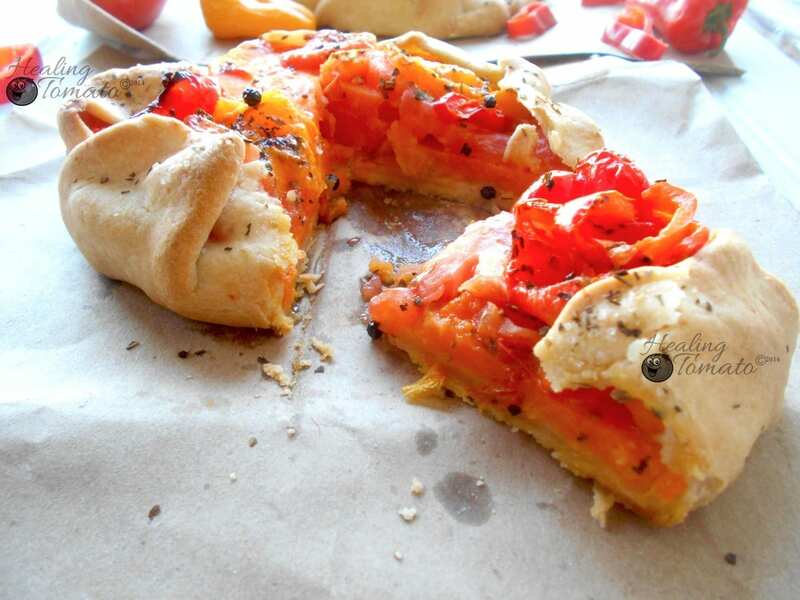 Your tomato galette is absolutely stunning! I love the combination of flavors, especially the use of sweet potatoes. I am excited that Florida’s farmers’ market season will soon be in full “bloom” as I know local tomatoes and sweet potatoes will make this galette even more incredible. Thank you so much for sharing another wonderful recipe! Thank you so much, Linda. You are very nice and your compliments mean so much to me. You have been very supportive in this year and I appreciate it very much. If my blog is great, it is only because I have great role models like yourself. You have been an inspiration to me. I hope I can be supportive of you too. G’day! Looks great Rini! Love rustic tarts! Thank you so much, Joanne! You are really nice and I like your pics/recipes too. Happy blog birthday! This recipe looks fantastic! Thank you, Marie. I appreciate it very much. Congratulations on your anniversary! You blog has grown beautifully. 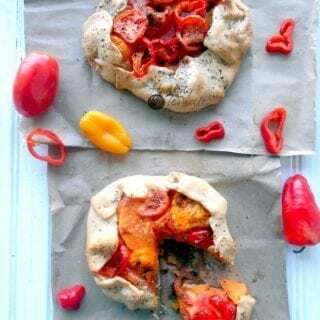 I love this tomato galette, it’s like a healthy pizza and I would not feel guilty eating it. I love the addition of the sweet potatoes. Thank you, Janette. I appreciate it very much. Your friendship and support over the last year has meant so much to me. Happy blog birthday!!! And this recipe, sounds incredible!!! Thanks so much for sharing!! Thank you, Ashleigh! You should definitely “Run” and not “walk” to the store. I know you will like this dish.